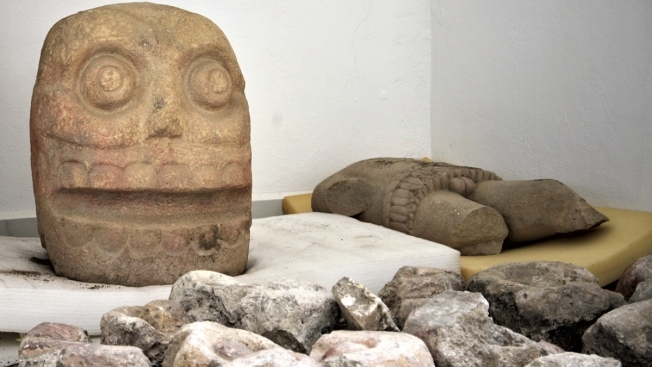 In this 2018 photo provided by Mexico's National Institute of Anthropology and History, INAH, a skull-like stone carving and a stone trunk depicting the Flayed Lord, a pre-Hispanic fertility god depicted as a skinned human corpse, are stored after being excavated from the Ndachjian–Tehuacan archaeological site in Tehuacan, Puebla state, where archaeologists have discovered the first temple dedicated to the deity. Although depictions of the god, Xipe Totec, had been found before in other cultures, a whole temple had never been discovered. Mexico's National Institute of Anthropology and History said the find was made during recent excavations of Popoloca Indian ruins in the central state of Puebla. University of Florida archaeologist Susan Gillespie, who was not involved in the project, wrote that "finding the torso fragment of a human wearing the flayed skin of a sacrificial victim in situ is perhaps the most compelling evidence of the association of this practice and related deity to a particular temple, more so to me than the two sculpted skeletal crania." "If the Aztec sources could be relied upon, a singular temple to this deity (whatever his name in Popoloca) does not necessarily indicate that this was the place of sacrifice," Gillespie wrote. "The Aztec practice was to perform the sacrificial death in one or more places, but to ritually store the skins in another, after they had been worn by living humans for some days. So it could be that this is the temple where they were kept, making it all the more sacred."